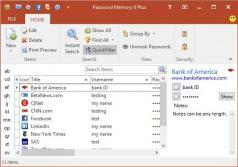 Password Memory is a powerful password manager that lets you safely store passwords and credit card information. To create a new database simply give it a name, a location and set a password for it. For each new item you add to the list you’ll have to provide a title, username, password, link, icon, valid days, belonging group and personal notes. Users can add as many items as they want, and usernames and passwords can be copied to the Clipboard. The export options let you save the stored information as HTML, XML or Excel files. Furthermore, Password Memory has a built-in search tool and lets you organize entries into groups, backup and restore the database and filter entries by title. The user documentation included within the application can help you learn essential tasks quickly, altough the layout is quite intuitive allowing you to easily find and navigate through the configuration preferences.